Uses : Principle constituents of Malabar nuts are the several alkaloids present and chief principle being quinazoline alkaloid, vasicine. The leaves are rich in vitamin C and carotene and yield an essential oil. The shrub is the source of the drug, well known in indigenous systems of medicine for its beneficial effects, particularly in bronchitis. The leaves, flowers, fruits and roots are extensively used for treating cold, cough, whooping cough, chronic bronchitis and asthma. It acts as a sedative, expectorant, antispasmodic and anthelmintic. It is a bronchial antiseptic, bronchodilator and expectorant. 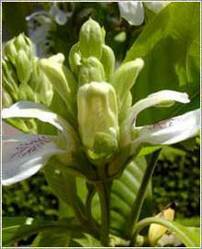 The roots, leaves and flowers and active principles of the plant possess a number of pharmacological properties and are used in cough, chronic bronchitis, rheumatism, asthma and bronchial asthma. Fresh juice of leaves have been used in treatment of tuberculosis. Its local use gives relief in pyorrhea and in bleeding gums.